Yikes! My ‘to read’ list is growing and growing. I blame the New York Times review. I blame award announcement season. I blame Amazon. I also blame friends who keep saying, ‘you have to read this!’. I will get through the pile, book by book, but am mostly eager to start with novels ages 9 through 13. I’m really going to try not to buy any new titles for at least 60 days!!!! Miles and Amy are two very likeable characters each coping with the trials of middle school, the strengthening of family ties and the sorry of death. Miles is an avid bowler (his family owns the local bowling alley in town). Amy lives in a funeral home run by her uncle. She is the new girl in the school, trying to fit in and cope with a disability that requires her to wear special shoes. An enjoyable and rather breezy read. Alex Gino, author of the book George, has written a great book to help young readers think about differences, about family and about friendships. Jilly’s sister is born deaf and Jilly wants to be the best sister she can be, learning to become an ASL user and doing the right things medically, politically. Jilly engages with a group of friends online and these conversations help her learn more about diversity which grows when she connects with Derek who is a Deaf Black ASL user. This novel is one of my favourites in this list. All burnt-out teacher, Mr. Zachary Kermit wants to do is retire. He just needs to stick it out for one more school year. Alas, he has been assigned a group of students – the unteachables – special needs ‘misfits’ that nobody wants to teach, especially Mr. Kermit who’d rather hand out daily worksheets while he does his crossword puzzle. Over the course of the year, these special kids get wiser and Ribbit (the kids name for their teacher) awakens to the challenges of life and teaching and caring. Another funny engaging novel from a terrific author. (Note: I invite educators to read The Troublemakers: Lessons in freedom from young children at school by Carala Shalaby as a companion to this novel). This title was recently given a 2019 Newbery Honor award. The medieval setting and pilgrim quest is filled with mystery and miracles. I would say however, that the narrative adventure has a strong appeal for particular readers who reading of long ago times, particularly regarding religious quests combined with fantasy adventures.. I would say that The Book of Boy would is particularly deemed for strong readers. The writing is fantastic and the rich production of the book (woodcut illustrations introducing each chapter, bevelled pages) is striking. Another adventure from the James Patterson factory. Max Einstein, an orphaned girl, is a genius who is challenged to do some good in the world. Max would certainly become best friends (rivals?) with Sheldon in The Big Bang Theory. A frenetic plot has her and a group of other genius students solve the solar power problem in the Congo. This book is for readers who are intrigued with espionage adventures and who connect strongly to the world of science. I am neither and sort of lost interest about 2/3 of the way through andfelt the ending sort of drizzled, because lo and behold there will be a sequel. My friend Jim brought me this amusing chapter book title by Australian author Adam Wallace and artist James Hart. The authors have a popular series (Accidentally Awesome, Blunderingly Brilliant) that tell describe the farcical antics of kids caught in amusing circumstances. The hero of this funny story is challenged to find out who is stealing the chickens from the farm owned by his grandparents. The bestselling author, Eric Walters has done it again with another terrific book. Reading fiction can also be like reading nonfiction and with this novel, the author’s extensive research into the life of elephants (and wolly mammoths is evident. An engaging adventure about a girl and her father who run an elephant sanctuary. The plot thickens when a philanthropist enters the picture with a life-changing scheme that is certain to rock the world of biology. Nominated for a Silver Birch award 2018. 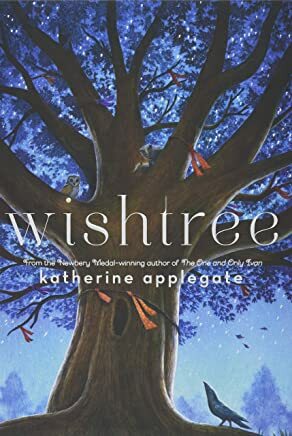 Katherine Applegate’s titles have appeared on several of Dr. Larry Recommends postings and Wishtree is worth mentioning again. And again. SHOUT OUT: Larry has a new book!!! 101 ways to inspire and engage students by building vocabulary, improving spelling and enriching reading, writing and learning.